A baby shower and some honest opinions…..
Sunday, May 29th, was my first baby shower. This was the family one, and I allowed mom to throw the ultra girlie baby shower that she always dreamed of. It was actually not as bad as I thought it was going to be, especially since she said it was going to be a “Princess Tea” baby shower. I don’t really know what that means, but I expected lots of pink and frills. 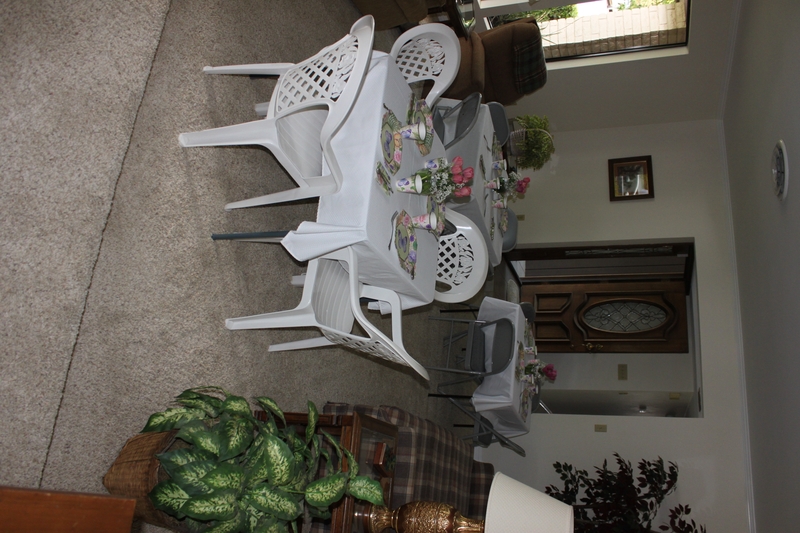 There were folding tables set up in the family room, which is shared with the dining room (separated by a single step). Each table was covered with a simple white table cloth, and upon each table were paper plates and paper cups decorated with butterflies and flowers. Mom used her good silver with this, which always weirds me out, but oh well. Sue had gone to Vons for pink and purple tulips, as well as baby’s breath, and also to the dollar store for vases and ribbons, and when everything was put together, it was quite lovely. Very simple, yet very pretty. I was please when I saw the set up when I arrived into town Saturday afternoon. Lunch was yummy and all home-made: mom made the lasagna, Christine made the Caesar Salad, Annette brought garlic bread (ok, so THAT wasn’t home-made, it was store bought), and Sue brought berries with yogurt and granola to put on them. 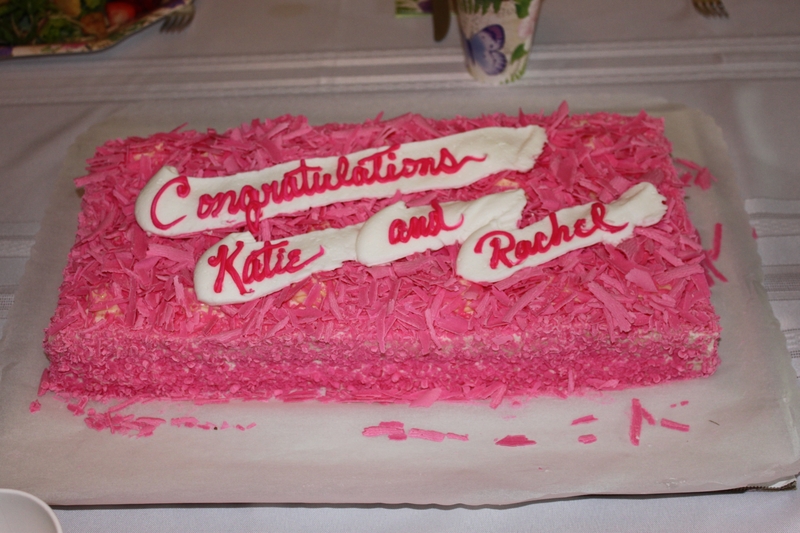 For dessert, there was the pink Champagne cake Aunt Colleen picked up that I requested from Smith’s bakery. Its just not as good from anywhere else! I got lots of presents, mostly clothes which were cute and I enjoyed, but I got the stroller I really wanted, and that made me very happy. It was after the shower was over (3.5 hours later) that things got interesting. Two of my best friends were there, and apparently they made it clear to mom during the baby shower that they neither like nor trust the baby’s daddy. I understand where this comes from, the dislike part anyway. He had hurt me very badly a few years ago, needlessly. All he had to be was honest, but apparently that was too hard for him. So, he hurt their best friend. Who’s gonna like someone who does that? So, I let that go. Their distrust? They don’t think he’s going to be a good daddy. They don’t think he’s going to be there to help me with Rachel. I tell them that he’s a great daddy to his boys and spends as much time with them as he can, so I’d be very surprised if he was less of a great daddy to Rachel. Personally, I just don’t see it as being possible. They do, and I chalk it up to them not knowing him. So, on my way out of town later that evening, I stop by my friend’s place to pick up a cd of the pics she took during the party. We chat and I use the restroom (of course) and then she walks me to my car. I didn’t know it was because we needed to talk in private. Again, she tried to convince me to move to Bakersfield, I mean, really pushed for it. She even suggested moving back and commuting to work everyday, which completely contradicted her argument earlier in the week that I’d have more time with Rachel if I moved back to Bakersfield. Of course, that was to take a part time job. Rachel needs her daddy; I will not consider moving away from him unless I absolutely have to (eg: lose job and the only one available is not in Socal), or he proves harmful to the child (child being abused or neglected in some way). These are just a few of the reasons, but when I was really starting to get annoyed with her (she was still pushing even AFTER I refuted every argument) that I realized why she was trying to get me to move back so hard. At first, I thought it was because she missed me, which she does, but she doesn’t miss me THAT much. Then it hit me, she’s worried. She’s not worried about me being out here all alone with Rachel, she’s worried about me being out here with Rachel’s daddy. She’s worried about the fact that he’s in my life. She knows what we all know, which is that he’s going to break my heart again. No, we’re not together or anything, but that doesn’t mean I’m not going to get heart broken at any point in the future. I hope that I don’t. I hope that when Rachel comes out that I haven’t another thought or feeling to spare for him. They don’t think that’s going to happen. They think I’m going to see this man holding our baby daughter and my heart is going to melt, and I will fall completely head-over-heels in love with him again, if I haven’t already. Have I? If I have, I’m very good at denial……so far. Be that as it may, they know that I can’t afford to break like I did in November of ’08. I will have a child to take care of, and I will need everything I have in me to do it. So they’re just waiting now…..waiting to see what happens….holding their breaths and checking up on me. Making sure I’m ok, making sure I’ve not broken down, making sure I’ve not gone and done something stupid. This entry was posted in Family, pregnancy, Uncategorized. Bookmark the permalink. 1 Response to A baby shower and some honest opinions…..
You friends love you and are worried about you just like good friends should, I think they worry comes from a good place…You are lucky to have friends like that…you must do what is best for you though and for Rachel. hugs. Every thing will be okay.